Ariel Kong (“Air filters won’t fix our city’s poor air quality”, October 28) says children need to understand the causes of pollution and “get into the habit of using public transport”. And adds that hopefully when they grow up they will choose not to buy a car and “we will have fewer polluting vehicles on our roads”. If she would read the Environment Bureau’s March 2013 paper on pollution, “A Clean Air Plan”, she would know that private vehicles account for a tiny fraction of the pollution caused by commercial vehicles and buses, especially the old ones. On page16, she would see a graphic and the numbers: for particulate pollution, goods vehicles produced 890 tonnes, buses 270 tonnes and private cars just 20 tonnes annually (1.72 per cent of the total for buses plus goods vehicles); for nitrogen oxides, the numbers show goods vehicles produced 36,950 tonnes, buses 9,640 tonnes and private cars just 890 tonnes (1.91 per cent of buses plus goods vehicles). Overall, buses (about 20,000 of them) produce 11 to 14 times the pollution of the 500,000 private cars in Hong Kong. Buses do carry more people, on average, but commercial vehicles and buses remain the overwhelming source of Hong Kong’s roadside pollution. That Ariel Kong misses this point shows the success of the transport lobby in obscuring it, and highlights the immorality of their continuing refusal to protect the health of Hongkongers, old and young. UNICEF published the study, “Clear the Air for Children,” a week before the annual UN climate-change talks, with the upcoming round to be hosted by Morocco on November 7-18. Toxic air is a drag on economies and societies, and already costs as much as 0.3 percent of global gross domestic product, the broad measure of economic activity, UNICEF said. Those costs are expected to increase to about one percent of GDP by 2060, it said, as air pollution in many parts of the world worsens. Together, outdoor and indoor air pollution are directly linked to pneumonia and other respiratory diseases that account for almost one death in 10 in children under the age of five, or nearly 600,000 children, making air pollution a leading danger to children’s health, UNICEF said. Children breathe twice as quickly as adults and take in more air relative to their body weight. To combat these noxious effects, UNICEF will call on the world’s leaders at the UN’s 22nd meeting on climate change in Marrakesh, known as COP22, to take urgent action to better protect children. “Reducing air pollution is one of the most important things we can do for children,” UNICEF said in its report. At the government level, UNICEF said steps should be taken to reduce fossil-fuel emissions and increase investments in sustainable energy and low-carbon development. The agency, noting that air quality can fluctuate rapidly, also called for better monitoring of air pollution to help people minimize their exposure. Children’s access to good-quality healthcare needs to be improved and breastfeeding in the child’s first six months should be encouraged to help prevent pneumonia. Policymakers should “develop and build consensus on children’s environmental health indicators,” the report urged. China’s growth strategy also has international consequences. Air pollution from China travels east to Japan, Taiwan and South Korea and across the Pacific to the U.S. west coast. And China’s heavy use of fossil fuel has made it the world’s largest greenhouse gas emitter, raising the risk of severe climate change. In our book “Blue Skies Over Beijing: Economic Growth and the Environment in China ,” Professor Siqi Zheng of Tsinghua University and I argue that rising demand for environmental protection in China is an emerging trend that will improve the standard of living in China and increase overall global sustainability. In one interview for our book we talked to a Beijing resident with a Ph.D. from Tsinghua University, whom we identified at his request as Mr. Wu (many Chinese hesitate to be quoted by name criticizing urban living conditions). He said that his family planned to move to Canada or the United States after he earned enough money, in order to protect his daughter from dirty air and contaminated food and water in Beijing. These results suggest that China’s urban consumers trust government pollution announcements now — but this was not always true. Past research has documented that government agencies manipulated data to overstate the number of “blue sky” days between 2001 and 2010. Beijing is also notorious for its traffic congestion. China’s recent investment in “bullet trains,” which travel at roughly 175 miles per hour, has increased access to mega cities. For example, people can now live in the nearby second-tier city of Tianjin and commute to Beijing in 30 minutes by train, instead of 1.5 hours by car. We have documented increased home prices in second- and third-tier cities connected by bullet train to Beijing, Shanghai and Guangzhou. The urban history of the United States suggests that a city’s environmental conditions can greatly improve within a short period of time. Pittsburgh, which was heavily polluted during its heyday as a steel-making town through the 1960s, has transitioned to a high-skill economy and now markets itself as green and sustainable. Xiamen’s leaders are pursuing a growth strategy based on the city’s amenities. A high-level municipal official told us they are using beach access, clean air, temperate climate and high-quality urban services to compete for talent and new firms. This strategy creates incentives for local leaders to invest in improving quality of life, and offers mobile urbanites choices about where to live. China’s transition from heavy manufacturing to a modern service economy will not be painless. Hundreds of millions of low-skilled workers prefer safe employment at a government factory, even if it means their city is polluted. One decentralized approach would be to allow some cities to become green centers featuring technology-driven high human capital industries while others continue to rely on heavy industry. By Matthew Kahn, Professor of Economics, University of Southern California – Dornsife College of Letters, Arts and Sciences. Three environmental officials in northern China have been questioned by the police after air quality tests were allegedly doctored by putting cotton wool in the sampling equipment to filter out impurities, according to a newspaper report. One official in Xian in Shaanxi province is also accused of manipulating air pollution data stored in a computer, the Huashang Daily reported. Environmental protection officials around China are under pressure to take measures to improve air quality after the central government announced two years ago that it had “declared war on pollution”. The allegations of fiddling test results have been made against the director of the Chang’an bureau of Xian’s environmental protection agency, plus the director and deputy director of the air sampling station in the district, according to the report. The director of the air sampling station sneaked into the station several times to manipulate data on computer after the station moved to part of the Xian University of Posts and Telecommunications, the newspaper said. The centre is also overseen by the China National Environmental Monitoring Centre and officials became suspicious after a sudden improvement in the quality of the data. Surveillance footage shot at the Xian monitoring centre was also allegedly deleted as staff knew the watchdog would be visiting, according to the article. A source with knowledge of the matter was quoted as saying that the director of the station may have feared punishment because of the poor quality of the data collected. Measures taken to ensure the accuracy of air quality monitoring include sending data immediately to the national environmental monitoring centre. Monitoring devices are also programmed to detect abnormal results and watchdogs visit sampling centres without advance warning to carry out checks, an employee at the Xian Environmental Protection Agency was quoted as saying. More than one million Chinese people died from illnesses linked to air pollution in 2012, according to figures from the World Health Organisation. The Chinese government has been stepping up its efforts to improve air quality in recent years, including setting up a no-coal zone in cities around Beijing next year in an effort to tackle the capital’s notorious smog. When former Canadian golf marketing executive Lisa Christensen first took part in a 1999 coastal clean-up event, little did she know she would commit her life to tackling Hong Kong’s waste problem. Neither did she know she would later found an environmental organisation empowering tens of thousands of people to clean up the city’s shorelines every year. Last year Christensen’s company Ecozine, a media platform devoted to sustainable lifestyles, engaged 75,623 people to clean up 4.6 million kilograms of trash from 2,447km of shorelines, country park trails and city streets during its annual Hong Kong Clean-up Challenge. Nissa Marion is the Robin to Christensen’s Batman in fighting the city’s environmental injustice. The former model and actress from Canada joined Christensen at Ecozine in 2010 and is now the editor-in-chief of its publications. The challenge has evolved from a one-day event 16 years ago to a nine-week programme enjoyed by individuals and corporations alike. With the latest challenge ongoing since September 1 and running till December 1, Christensen and Marion shared with the Post their views on how to address the city’s problem of plastic waste. What inspired you to start beach clean-up events in Hong Kong? LC: When I arrived in Hong Kong in 1997, I did a lot of hiking. I was up in Tai Long Wan in Sai Kung, and was shocked at all the trash I saw on the beach and how the beach was just completely destroyed. I had never seen anything like that, growing up in Canada where we have pristine, clean oceans. I just couldn’t get over what I saw there. So I investigated and found that Hong Kong had virtually no recycling system. It had a very high consumption rate, poor waste management strategies and solutions, and a big littering problem. So I joined a beach clean-up in 1999 with Christine Loh Kung-wai. She’s now the undersecretary for the environment. I was so inspired by what I saw that I decided to organise my own beach clean-up the next year. How did the original clean-up events eventually evolve into the annual Hong Kong Clean-up Challenge? LC: We had about 100 volunteers the first year. In 2003, we started to get more companies involved. That year I reached out to the organisers of the International Coastal Clean-up in Washington. They said they would love to have us as their Hong Kong representative. So that’s when real growth started. We grew from 50 volunteers to 150, and then 500, and eventually 7,500 volunteers. The number is still growing. As for the Clean-up event, we have seen around a 60 per cent increase each year. Last year, we had about 75,000 participants. How does the Hong Kong Clean-up Challenge work? LC: We identify hundreds of beaches that have not been routinely cleaned by the government, such as mangroves, rocky shorelines, beaches and even country trails. Companies and individuals can go on our website and choose a beach that is near their neighbourhood. They can then sign up as a team to participate. We provide all the know-how materials and education. We invite the team captain to collect and manage data when they collect the trash. This is a very important part of what we do. [The data] goes into a global index managed by Ocean Conservancy, a non-governmental ­organisation in Washington. And by the end of the challenge, teams can win awards for categories such as ‘Weirdest Item Found’, ‘Most Trash Collected’, ‘Largest Non-corporate Team’. We will invite our goodwill ambassadors like actor Daniel Wu and musician Jack Johnson to give out awards to winners at a ceremony. What are some of the most rewarding moments in a clean-up? NM: Almost every time we do a beach clean-up, someone in the group would come up to me and say: “Wow I had no idea. I am never using a plastic straw again,” or “I am never buying another plastic bottle of water again.” These small wins and those who share with me that they are creating a change in their lives based on their participation are so rewarding. It is inspiring to know that what happened to me is happening to other people. How has local environmental awareness changed over the years, and how has this impacted the Hong Kong Clean-up Challenge? NM: From our perspective, the awareness is increasing but action still needs to follow. We haven’t quite reached that tipping point yet. But we have seen people taking a stance and saying they want to do something about the environment. In 2003 when I first got involved, we would call companies and say: “Hey, we’ve got this great event and it’s free. We provide everything. It’s environmental and it’s about sustainability.” We’d say: “It’s CSR (corporate social responsibility)”, which is something they had not heard of yet. And the companies would say: “That sounds great! We love what you are doing but we don’t have any budget for that. It’s just not part of our company’s remit.” But now we have companies calling us to say: “We have the team, we have the budget and we have this CSR thing we have to fulfil, so can you help us out?” So there is this tectonic shift in the corporate world also. LC: When we first started, companies would say there is no way I could get my staff out in the sun without a mask, especially post-Sars. People would say: “You want me to pick up trash? That’s not my job. It’s someone else’s”. But now this is considered cool. How are global views on ocean conservation now compared to when you started? LC: Ocean conservation and waste management were never part of anyone’s agenda. It was always air pollution or climate change. But the recent Our Ocean Conference was held for the first time in Washington. President Barack Obama, Leonardo DiCaprio and others pledged US$4.2 billion (HK$32.6 billion) to clean up our oceans. Everyone at the conference was mentioning plastic pollution. So it has gone from being a non-issue to an issue of great significance where important people are paying attention. Some people are blaming the mainland for our coastal pollution problems in Hong Kong. What is your response to this? NM: The headlines say stuff like “Shocking amount of debris in Hong Kong”, but it’s really not shocking if you have been working on this issue for 16 years. It’s good that the media is picking it up. But the important thing to remember is that, yes, some trash from recent rainstorms was from China – from the Pearl River Delta. But that doesn’t absolve us of being responsible for our own waste. And there is a gross amount of waste washing up on Hong Kong shores that is from Hong Kong people. Pointing fingers is dangerous because it removes our responsibilities. [As an organisation], it’s very much our commitment to help Hong Kong take responsibility for its own waste footprint. LC: Personally I don’t see any immediate increase in the level of pollution. It has always been there. But of course the problem is worse compared to 16 years ago. The current is changing, and with it, the water direction, which affects how much trash is brought into Hong Kong’s coastlines. It’s seasonal. Freshwater from the Pearl River Delta also brings in trash. But whatever the case, I have personally seen local fishermen chucking litter into the water. Sometimes when you have 150 extra idle fishing boats in the harbour at times when they are not allowed to fish, they throw things into the water. I have witnessed dumping action in Hong Kong waters by Hong Kong vessels and entities – pleasure crafts, fishing vessels, individuals and contractors. I have seen it all. I know there’s been dumping action going on for years because the stuff we’ve been collecting off the beach – it’s not litter left by beachgoers. They are trash that has been dumped by boats out at sea, and brought in by the waves. What is new at this year’s Hong Kong Clean-up Challenge? LC: This year we actually initiated a registration fee for teams. It’s the first time we are doing this. So there’s a registration fee of HK$500 for a non-governmental organisation, school or a family. It is HK$1,000 for a small or medium company and HK$3,000 for a large company with over 100 staff. One other new thing this year is that Ocean Conservancy invited Hong Kong to host its 30th anniversary event. So from November 15 to 18, Ecozine will be organising the global event, inviting all the representatives around the world to come to Hong Kong for a global conference. Compared to the Commission’s proposal, the relaxed targets finally agreed by member states and parliament will result in thousands of additional cases of premature death. On 30 June, the last day of the Dutch EU Presidency, the Council and the European Parliament reached a provisional agreement on a new National Emission Ceilings (NEC) directive. The new directive establishes national limits for the emissions of five pollutants: sulphur dioxide, nitrogen oxides, non-methane volatile organic compounds (NMVOC), ammonia and fine particulate matter (PM2.5). The limits are set as binding National Emission Reduction Commitments (NERC), expressed as percentage reductions from the base year 2005. The NERCs for 2020 to 2029 are identical to those to which the member states are already committed in the revised Gothenburg protocol under the Convention on Long-Range Transboundary Air Pollution. Since these limits in many cases allow emissions that are even higher that what is expected to result from countries implementing already adopted legislation, they have widely been criticised for their weakness. More importantly, new stricter NERCs from 2030 have now been agreed. These are set to reduce the health impacts of air pollution by 49.6 per cent in 2030, compared to 2005. While the Commission and the Parliament aimed for an ambition level that would result in a 52 per cent reduction in premature deaths from air pollution, the Council (i.e. the member states) argued for a significantly less ambitious target of 48 per cent. The compromise now agreed has been estimated to result in some 10,000 additional annual premature deaths in 2030, on top of more than a quarter of a million annual premature deaths that are expected to remain if the Commission’s proposal was to be implemented. 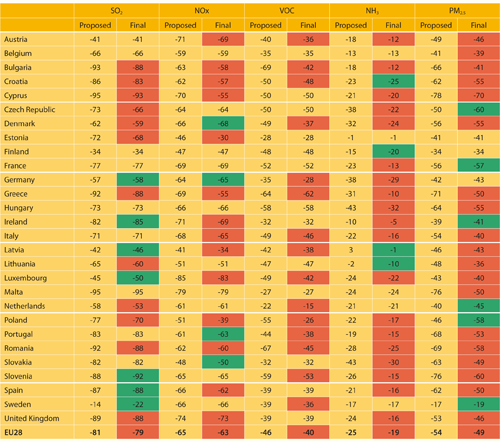 Looking at the specific NERCs for each member state, and comparing these with the Commission’s proposal, it was agreed to lower 79 of the 140 targets for 2030, while agreeing to keep 40 at the level proposed by the Commission, and setting more ambitious targets in just 21 cases (see Table). At the bottom of the league among member states we find Bulgaria, Greece and Romania, who have all chosen to weaken their NERCs for all five pollutants, while Austria, Denmark, Italy, Poland and the UK lowered targets for four of the pollutants. In contrast, Finland accepted all its targets, closely followed by Belgium, France and Sweden, which stick to four out of the five targets. As icing on the cake, Finland has opted for a tougher target for ammonia, and Sweden has opted for tougher targets for both sulphur dioxide and PM2.5. For the EU as a whole, ammonia and NMVOC are the pollutants for which the ambition level has been downgraded the most, by six percentage points. This outcome for ammonia is particularly remarkable as the emission cuts achieved so far for this pollutant have been very modest compared to those for the other pollutants, especially considering that the proposed reduction target for 2030 was much less ambitious than for the other pollutants. Member states managed to remove the ozone precursor methane completely from the directive, despite objections from the Parliament and the Commission. Here, the industrial farming lobby was instrumental in pushing through both the drastically lowered ambition for ammonia and the removal of methane. Moreover, member states succeeded in introducing a variety of additional flexibilities in order to make it easier for them to comply. While the Commission had already included three flexibilities in its proposal, five more have now been added to the final text. Environmental organisations have strongly criticised these flexibilities, claiming that they will result in higher emissions; delayed reductions; more avoidable deaths and environmental damage; more unnecessary administration; and an unenforceable directive. Because of the lax 2020 targets, and to better ensure that countries really are on track to meet their 2030 NERCs, the Parliament had also pushed for binding targets for the intermediate year 2025. The Commission’s proposal included only indicative (i.e. non-binding) targets for that year. Here, member states succeeded in watering down even the already weak Commission proposal, so that now there are only vague guiding figures for 2025. On 12 July, the Parliament ’s environment committee voted to support the provisional NEC deal, with 43 votes in favour and 14 against. Before it comes into force, the NEC proposal will go to the Parliament for a vote in plenary in November, and after that the Council will need to officially endorse the text. Table: Country-by-country national emission reduction commitments (NERC) for 2030 in per cent as compared to the base year 2005. Left column shows the Commission’s proposal, as adjusted in early 2015; Right column shows the final outcome, as agreed on 30 June 2016. Outdoor air pollution could cause up to nine million premature deaths a year by 2060 and cost US$ 3.3 trillion annually as a result of sick days, healthcare expenditure and reduced agricultural output, unless action is taken. In 2010, outdoor air pollution caused more than three million premature deaths worldwide, with elderly people and children most vulnerable. New projections presented in an OECD report “The Economic Consequences of Outdoor Air Pollution” imply a doubling, or even tripling, of premature deaths from particulate matter (PM2.5) and ozone (O3) – or one premature death every four or five seconds – by 2060. The projected increase in concentrations of PM2.5 and ozone will result in significant economic costs to society. The direct market impact of air pollution in terms of lower worker productivity due to illness, higher spending on health care, and lower crop yields, could exceed US$ 3,000 billion annually by 2060, equal to one per cent of GDP. For example, between now and 2060, the number of annual work days lost to air-pollution-related illness is expected to jump from 1.2 to 3.7 billion. These estimates of economic market impacts do not however reflect the true costs of air pollution because shortening of people’s lives and pain and suffering from respiratory and cardiovascular diseases do not really have a market price. The OECD has therefore also estimated the non-market welfare costs by using economic studies on how people value their health and how much they would be prepared to pay to reduce the health risks, i.e. by introducing policies and measures that would cut air pollutant emissions. Based on this data, the current (2015) annual global welfare costs of mortality and morbidity from outdoor air pollution are estimated at US$ 3,440 billion, and by 2060 they would amount to between US$ 20,000 and 27,000 billion a year (see table). It should be noted that air pollution damage to ecosystems, biodiversity and our cultural heritage has not been assigned any monetary value and is therefore not included in these economic estimates. According to the projections, the biggest rises in air pollution mortality rates are expected in India, China, Korea and Central Asian countries, where rising populations and congested cities mean more people are exposed to high levels of pollution. The premature death rates are forecast to be up to three times higher in 2060 than in 2010 in China and up to four times higher in India. Mortality rates are however seen to be stabilising in the United States and falling in much of Western Europe thanks in part to efforts to move to cleaner energy and transport. Projected GDP losses will be biggest in China, Russia, India, Korea and countries in Eastern Europe and the Caspian region, as health costs and lower labour productivity hit output. “It is time for governments to stop fussing about the costs of efforts to limit air pollution and start worrying about the much larger costs of allowing it to continue unchecked. Their citizens’ lives are in their hands,” concluded Simon Upton.